If the doubters are correct, we’ll be unable to breathe and, if they’re wrong, we’ll all die horribly. If we reduce greenhouse gases but it makes little difference to global warming, I’m happy to sit in a room for a month or so while the doubters go “nya nya nya”. I’ll still be breathing easier. This is somewhat obscure, but I think that by “we’ll be unable to breathe” he imagines the atmospheric carbon dioxide building up to suffocating levels. But when he says “we’ll all die horribly” he guesses at a death by fire. Neither has any scientific justification (there’s not enough oil and coal to produce that much CO2) and they are mutually exclusive (CO2 extinguishes fires). Life evolved when CO2 levels were ten times higher than now. This is the most stupendous nonsense. If this really is his opinion, which is hard to believe, his opinion is a soup. But it’s not a pollutant. The pure, invisible, odourless, life-giving carbon dioxide that feeds all life on Earth and without which all humans would die was first described as “pollution” by misguided, militant environmentalists in the dying years of the 20th Century. Isn’t it amazing how the term has become popular among the ignorant? I can understand that the CSC wants to believe that man-made climate change isn’t happening. I’d like to pretend it wasn’t happening as well. However, the scientific evidence continues to mount and, if we piled up all the research, it would reach the top of what’s left of our atmosphere. The Coalition certainly believes that man-made climate change is happening, it only queries the magnitude. And why not query the magnitude? Instead of citing some evidence, Fisher claims we might pile it up. Have you noticed how everybody else does that? Here is a challenge (let’s call it Sam’s Challenge): cite some evidence! Sam, if you send us some evidence that human activity is dangerously warming the planet, or will do so, we’ll review it with the utmost speed. So please rush it over! Just leave a comment below containing your references, there’s no need for expensive couriers. We’re dying to see the evidence! I note in passing Fisher’s stupid reference to “what’s left of our atmosphere.” Quite obviously, media relations people are not required to study the topics they “communicate.” Nobody is claiming that our atmosphere is being destroyed, so where he gets this notion from is a complete mystery. He makes a silly joke about CFCs, attempts a connection with US creationist beliefs, name-drops our favourite Boston Legal stars and descends to peurile hair jokes in a rant that defies belief while proffering no facts at all. Courts aren’t the best place to test science – for a start, there are no Bunsen burners. And in resorting to a flippancy that reduces our legal adventure to a triviality he does the same to his opinion. If only he had read our Statement of Claim, he would have had more material; if he had asked us a few questions, he could have sounded knowledgeable. It is even less well-researched than Rudman’s article and possibly more one-eyed: it is pugnacious and uninformed. Fisher can perhaps write, but the jury must be out on whether he can think. Is that par for the course for a Fellow of the Public Relations Institute and professional Social Media Strategist? You can read more about dear Sam here. And shame on the Herald once again; their biased colours are again nailed firmly to their obstinate mast. I sent them an opinion piece just three days after they printed this which they declined to use. To publish this empty bombast but give my voice no air in rebuttal shames their noble history. But, Fisher is contributing to excellent fish-wrapper. Public Relations Institute and media strategist? 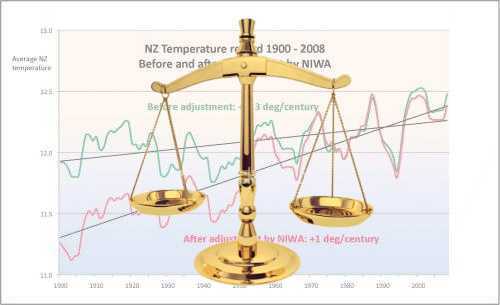 Is this the fellow who NIWA (ie the taxpayers) just paid fat fees to answer all the questions being asked about their lousy temperature record? Or does he work for the Science Media Centre which gets $10,000 a week from taxpayers to tell us what to think about global warming? Quelle horreur – maybe he is the sole remaining PR hack who hasn’t yet picked up any AGW propaganda cheques from the government! No wonder he sounds disgruntled. But after this rant he will probably find a slot at the trough. The more the CAGW edifice crumbles, the more shrill the ignorant become, wailing and gnashing their obstinate teeth at those who dare to think independently and who dare to question authority. I wager that the following will not appear in the NZ Herald or any Fair(? )fax rag. But this is good stuff, long overdue and well said in the obdurately pro-AGW Times (of London). The final para could be applied to many in NZ, including young Nicky Smith. That means he’s providing a service, Richard!